I’ve mentioned on several occasions my affinity for Metroidvania titles, so let’s just forego that bit in my introduction. 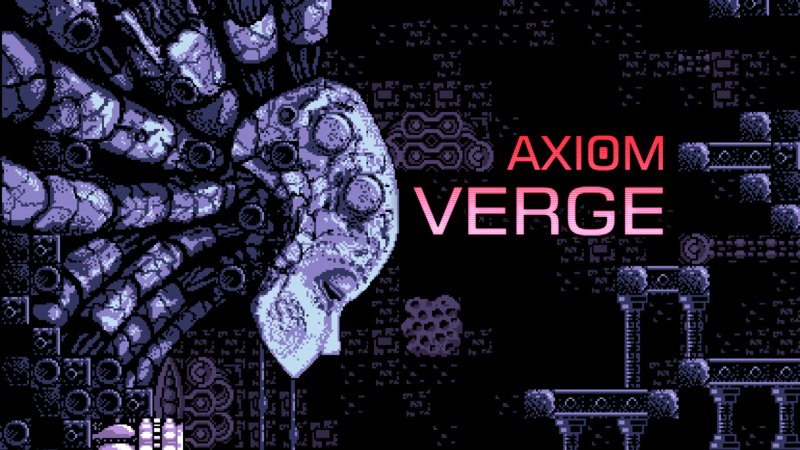 While I have had the good fortune of reviewing several games lately that contained elements of this genre, none have been as close to the mark as Axiom Verge, a 2D action platformer from developer Tom Happ. With a crazy sci-fi story about death and resurrection, plenty of weapons and abilities to access new areas and collectibles hidden in every nook and cranny, there were many times I felt that I was playing the true spiritual successor to the original Metroid. 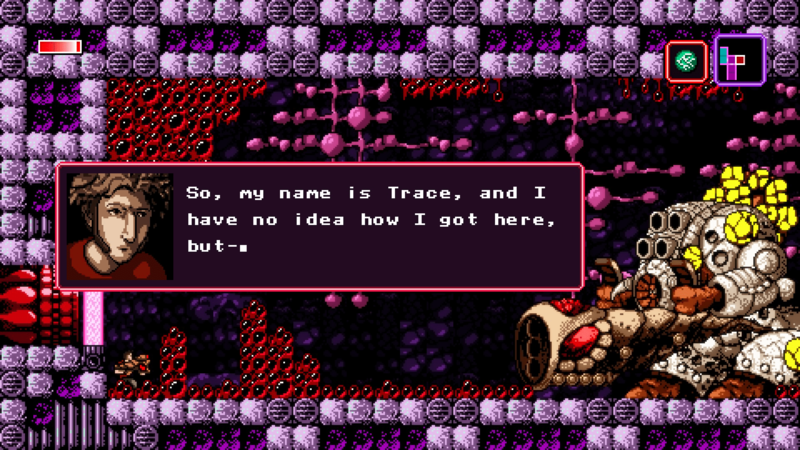 In Axiom Verge, players take on the role of Trace, a scientist apparently killed in a lab explosion during the game’s opening. However, instead of finding himself in any kind of afterlife, Trace awakens on a strange alien world where a giant robotic entity called Elsenova tells him he is the only person capable of stopping an evil being known as Athetos from carrying out his plans. I know that’s a little cagey of an explanation, but believe me when I say that the story — dealing heavily in reality and fantasy, as well as questions about life and death — would be best experienced firsthand. As such, it’s best to avoid spoilers as much as possible. 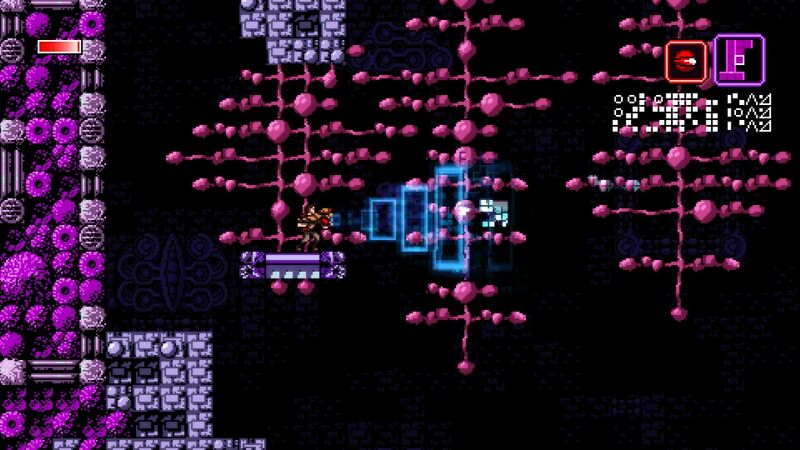 From a pure gameplay perspective, Axiom Verge feels almost indiscernible from the Metroid games from which it obviously borrows its inspiration… at least initially. Players guide Trace through a variety of 2D environments populated by creatures extremely reminiscent of those seen in the games of yesteryear. From little creatures that skitter along the walls to floating projectiles that bounce around endlessly to straight up hostile monsters that will slash or shoot at you, you’ll get the odd sensation that you’ve seen all this before. However, to draw too many comparisons to Nintendo’s classics would be a great disservice to this game. 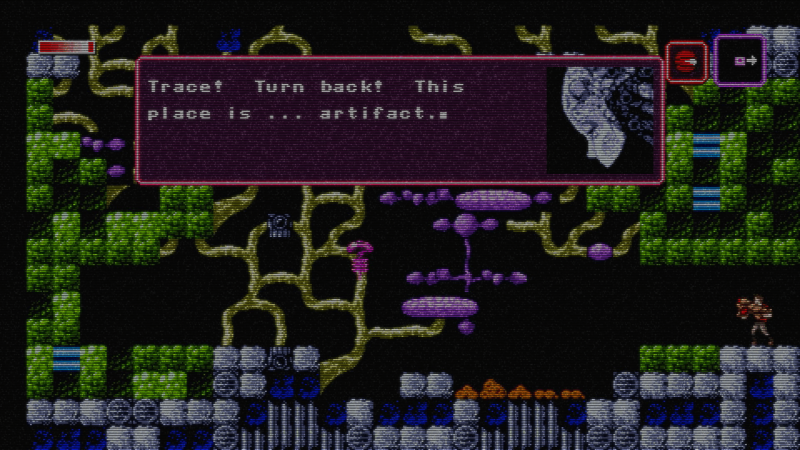 While Axiom Verge may seem like a mere clone on the surface, the deeper you dig into it, the more it differentiates itself from the source material, becoming more and more its own game. And you gotta fight a giant, screen-filling boss or two. Trace starts off with the Axiom Distruptor, a pretty basic blaster. However, his arsenal soon begins to grow with weapons that can be used to activate switches in narrow corridors too tight to walk through or even straight through walls. You won’t find yourself tossing aside old weapons for new ones, either. Almost every weapon has a situational use, and damage and range upgrades you find affect all of them, so these guns continue to have their uses for the duration. The weapons’ situational uses become most apparent during the game’s numerous boss battles. While it’s certainly possible to defeat the many giant monsters, robots and cyborgs that you’ll be taking on with the basic story-related firearms, you’ll surely have a better time if you’ve found some type of new attack that will give you an edge. Sure, you can just shoot straight at the giant robot while dodging its blasts, or you can find a high position and rain down fireballs from outside its firing range. These fights still can be pretty challenging even with the right tools, but it’s certainly better to come prepared. Your handy Drone will become an extension of yourself. Anyone who grew up playing the NES or other retro game systems will know that minor graphical hiccups like flickering graphics or glitched sprites were not an uncommon occurrence. However, while these kinks could be minor annoyances in other games – or warrant a complete restart at the worst – they’re actually a major tool for the player here. Arguably the biggest implement of this mechanic that players will be using is the Address Disruptor, a strange gun that glitches whatever you set your sights on, transforming enemies and specific areas of the environment. The effects of the gun vary depending on the target. It might cause an enemy to change their attack patterns, make it possible to stand on certain floating creatures or even glitch them right out of existence. Using the gun on certain flickering areas of the environment could also erase them or cause dangerous terrain to become traversable. I often found that, if I was ever lost, it was a good idea to start using the Address Disruptor on anything and everything, causing me to take on the mantra “When it doubt, glitch it out.” Players will also unlock a few different outfits for Trace that allow him to pass through obstacles, opening even more paths. 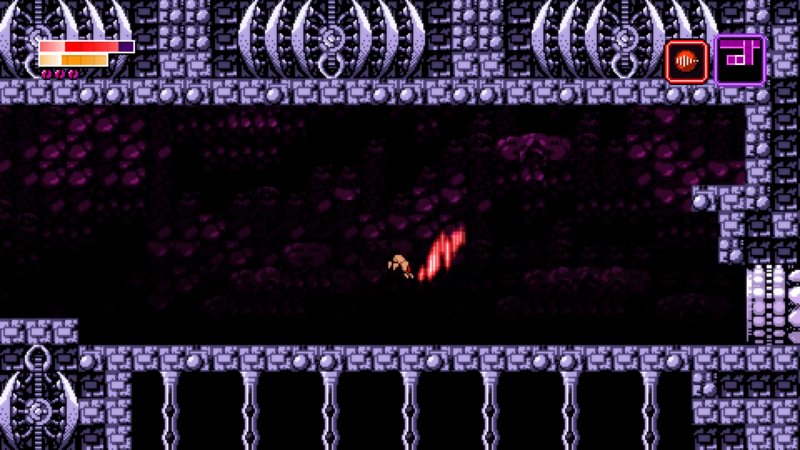 At times, this can even be used to go right through the game’s outer walls, making it possible to avoid some of the more troublesome, enemy-filled sections. There are also plenty of secret areas to discover. 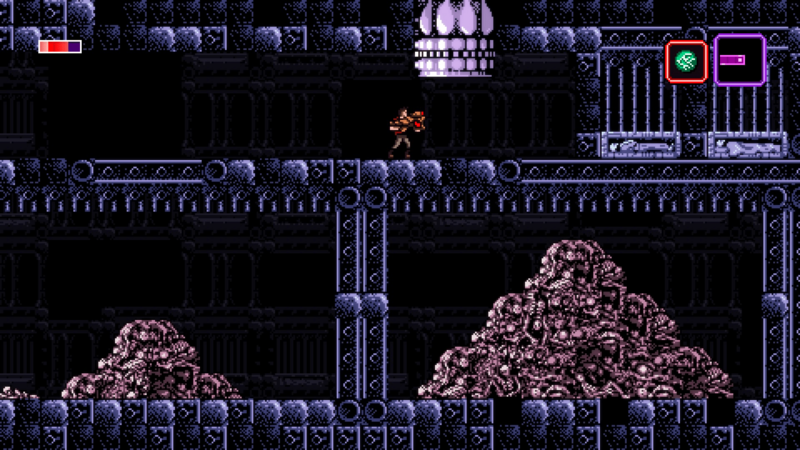 Axiom Verge is a treat for both the eyes and the ears. 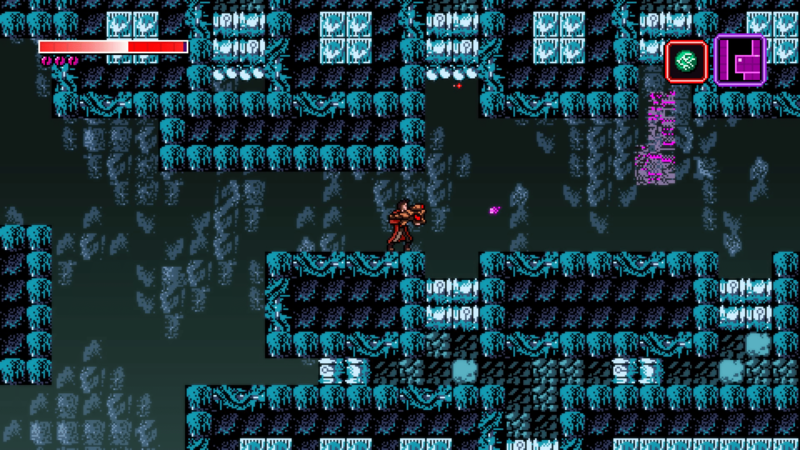 Anyone who has played those old Metroid games on NES and SNES will immediately fall in love with the presentation here. With all this talk of glitches, Happ did an excellent job of making those flickering graphics and off-kilter sprites look as realistic as possible. It takes a very specific skill set to make something that was normally a flaw look so… flawless. However, while we’re at it, let’s not forget about the amazing environments and music. The world is made up of nine distinct areas, all with unique environments and soundtracks. While you have your basic mines and sterile lab-like areas, I certainly wasn’t expecting the beautiful outdoor environments you discover later in the game. The sound, too, is spot-on. From the techno, chiptune and not-quite-vocalized music that perfectly fits each environment to the satisfying effects of damaging an enemy or digging through the earth to the startling shrieks the of zombie-like creatures bursting out of the ground, you aren’t going to want for anything in the auditory department. 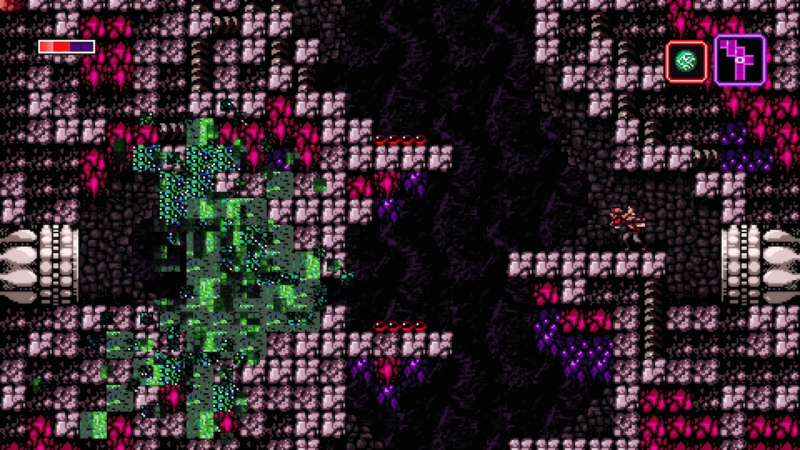 And what would a game about glitches be without arguably the most famous glitch of all? As with this genre of games, the intent is usually to beat them as quickly as possible. There’s even a “speedrun” option that you can select off the main menu to time you while you go, as well as a trophy for completing the game in under four hours. That said, though, it still took me about nine and a half hours before I finally saw the credits roll. Most of that time was spent just wandering, though. The game is huge and, while the story is great, it offers little in the way of guidance. 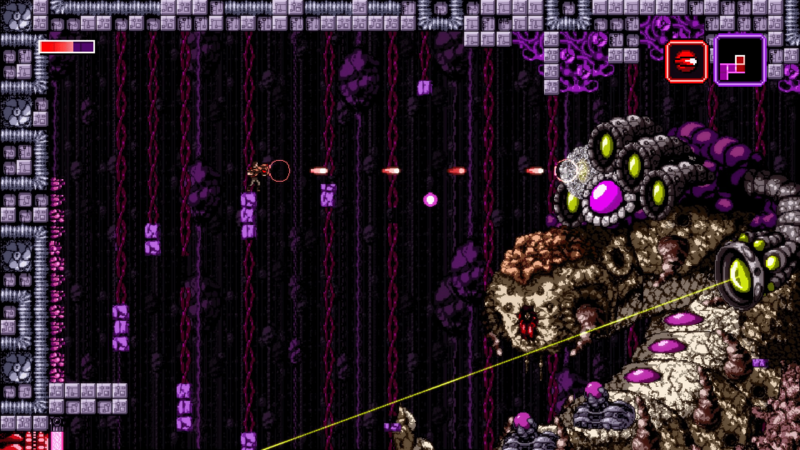 Axiom Verge is a game of pure exploration, leaving it up to players to study the map to discover new areas and how their ever-growing arsenal of weapons and equipment might help them advance. It’s a game that begs you to search everywhere imaginable for all of its secrets (which are plentiful), and one I enjoyed my time with from start to finish. For everything you get for the $20 asking price, the game is a steal. It very much feels like one of those instant classics that you’ll find yourself playing over and over for years to come, and one that only encourages you to get better and better every time you do. Next Post:Comic Crossroads Volume 2: Does Ultron Dream of Rock and Roll?